Have you ever tried Smoked Beer Can Chicken? Well, you’ve heard of beer can chicken, right? 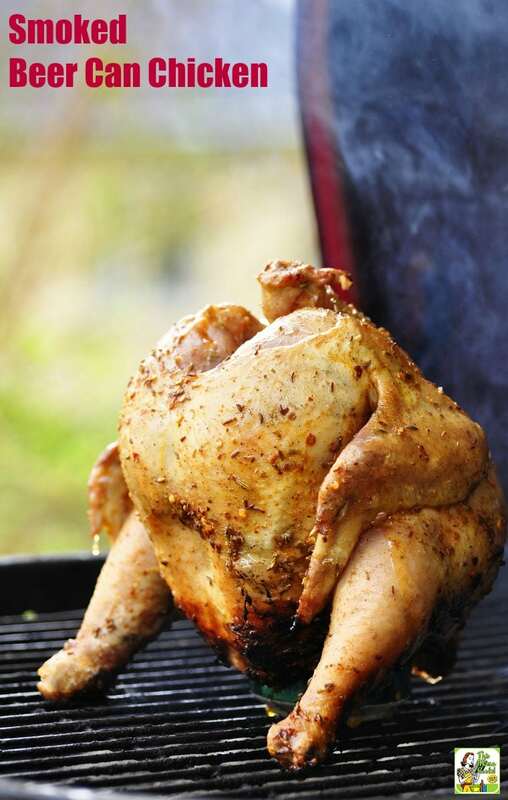 You know, the grilled chicken recipe when you shove a full can of beer up a chicken’s backside and grill it? Well, if you have a smoker, a few tools like a beer can chicken holder, a meat thermometer, some dry rub and premade marinade, smoking beer can chicken is super easy to do! First, there’s the smoker. You can use a Masterbuilt Electric Smoker. (You can read my smoker review here.) This was my go to smoker for Smoked Beer Can Chicken until we finally wore it out. Or you can use something like a Kamado Joe Grill. While I find it’s not as easy to use as an electric smoker, we now make Kamado Joe beer can chicken as well as steaks, ribs, and brisket. Amazing! What kind of beer for Smoked Beer Can Chicken? Well, what if you’re gluten free or don’t drink beer? These days, there are plenty of gluten free beers on the market to use in your smoked beer can chicken recipe. Or you can use apple, pear or pineapple juice if you don’t imbibe in alcoholic beverages. Just empty out a soda can and fill it with juice and the marinade as per the Smoked Beer Can Chicken recipe below. What equipment you need to make Smoked Beer Can Chicken? 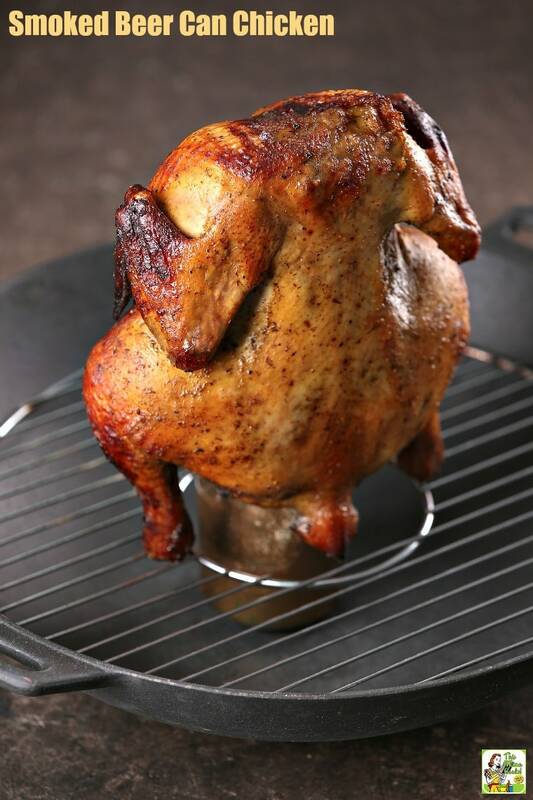 While you can simply use a beer can and perch your chicken on top, it’s so much easier to make a smoked beer can chicken recipe with a beer can chicken holders. I love my Steven Raichlen Stainless-Steel Beer Can Chicken Rack with Drip Pan, which is pretty simple to use. 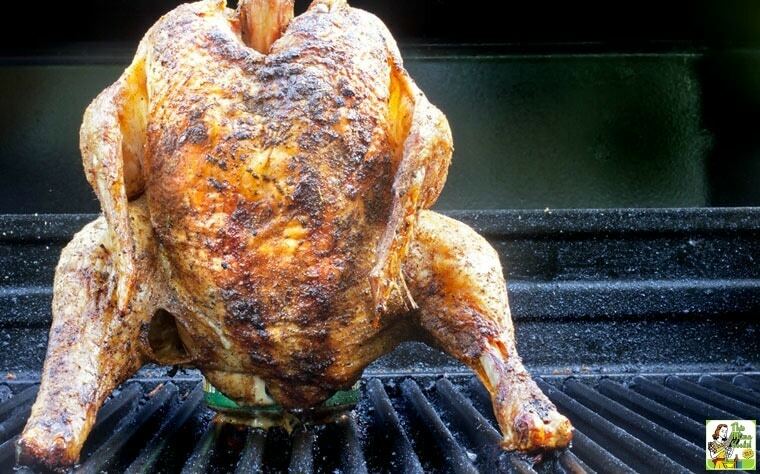 Since it’s compact, it’s a beer can chicken holder that’s easy to store in your grill, garage or pantry. You’ll also need a good digital cooking thermometer that you can run outside the smoker so you’ll know when your chicken is done. I love the remote wireless digital thermometers, because you don't have to go outside and check the grill to see if you've reached your ideal temp. Barbecuing meat tongs and heat resistant gloves are essential, too. Yes, you can use regular oven mitts, but they’ll get all greasy. Then the grease will soak through and you’ll burn yourself – ouch! I bought two pairs of silicon heat resistant gloves for our pig roast and they worked out great for turning the pig and lifting the entire pig off the grill when it was done. My husband uses them all the time for grilling on his Kamado Joe. You can use a store bought chicken or pork barbecue rub or make your own with salt, pepper, and whatever other spices you like. I’m sure you can find several good beer can chicken rub recipes in your favorite cookbooks. My favorite barbecuing cookbook is the Legends of Texas Barbecue Cookbook. In fact, the method I use to cook Smoked Beer Can Chicken is from that cookbook! You can look online or in cookbooks for beer can chicken marinade recipes. Or you can use store bought marinades that are made just for chicken. However, store bought or home made vinaigrette salad dressing would work just as well for your Smoked Beer Can Chicken and is probably a few bucks cheaper. You can make your own marinade with olive oil, vinegar, fresh herbs from the garden, or whatever you find in your spice rack. Some other seasoning ideas to add to your beer can chicken marinade are minced garlic, fresh minced ginger, and seasoning salt. Seasoned olive oils and vinegars, as well as a dash of lemon juice, would be delicious, too. Whatever you do, don’t forget to save the chicken carcass and skin to make stock. There’s nothing better than using smoky chicken stock in soup and other recipes. 1. After roasting your Smoked Beer Can Chicken, take the carcass or bones and place them in your slow cooker. Cover with water. 3. Add some crushed garlic cloves. Cut up an onion, a couple of carrots, parsnips, and some stocks of celery and add them all to the slow cooker. 5. Remove large pieces from the slow cooker and strain the liquid into freezer food storage containers. Freezer and label with date. Pour liquid into a couple of ice cube trays. Freeze and store cubes in freezer bags to use when you just need a little stock in your cooking. Remove the giblets and rinse the chicken cavity. Season the chicken inside and out with the rub. Press the rub on to the skin, too. Allow to sit for at least an hour in the refrigerator. Open the beer and empty half of it into the smoker’s drip pan. Refill the can to the top with the marinade. Shove the can into the chicken cavity, and place the chicken on to the beer can chicken stand if you’re using one. Set the chicken on the grill on the beer can base, and cook for three hours. If you don’t use a dripping pan full of beer and water to “steam” the chicken, baste with more marinade every hour. When the chicken reaches an internal temperature of 165 degrees F (about three to four hours), test for doneness by inserting a knife tip into the thickest part of the thigh. If the juices run clear, the chicken is done to medium. Note: the FDA recommends cooking to 185 degrees F. Many people find this overcooks and dries out the chicken, so use your best judgment. Remove the chicken and let sit for 20 minutes to let the juices “set.” Slice and serve. Originally posted on August 6, 2012 and April 28, 2016. Updated with new pictures and information. Posted in Gluten Free, Recipes and tagged chicken, grilling and smoking on April 18, 2019 by Anne-Marie Nichols. Of course 185 will dry out your chicken. The new data from FDA says an IT of 165, like turkey – checked in the deep breast, is the safe point for poultry now. If you pull it at 160 and foil wrap it, it will reach the magical 165 IT. You can look online or in cookbooks for beer can chicken marinade recipes. 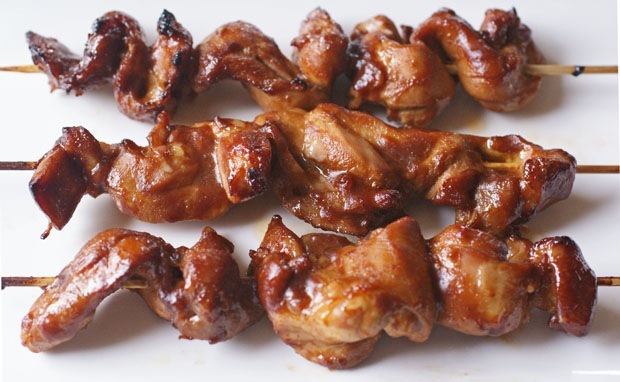 Or you can use store-bought marinades that are made just for chicken. I also like using a store-bought or homemade vinaigrette salad dressing as a marinade. I have always wanted to try this but guess I need to find GF beer in a can! You may recall I attended Steven Raichlen’s BBQU last year and learned so much. We did not do a beer can bird (though of the over 40 recipes over three days I may have forgotten). If it weren’t snowing I’d go seek some GF beer! Just empty a soda can and fill it with gluten free beer or a gluten free cider and you’ll be all set, Toni!